Anyone hiking through the remote Southern Arizona desert or stopped along the road has seen the artifacts of border crossers. I stumble across backpacks, water jugs, food cans, mayonnaise jars, jackets, shirts, pants, shoes, blankets, and toothbrushes all the time. Seems like an ecological disaster waiting to happen. These specially made shoe covers were found right next to the highway, about 40 miles north of the Arizona-Sonora border. I'm guessing the owner of the footwear managed to elude the Border Patrol. Look ma, no tracks! Last edited by tumamoc; 03-15-2013 at 07:36 PM..
. Seems like an ecological disaster waiting to happen. Already is. My buddies ranch in Douglas looks like a garbage dump. Illegals crossing in that area tend to kill ranchers that show them any kindness. Ironic huh ? 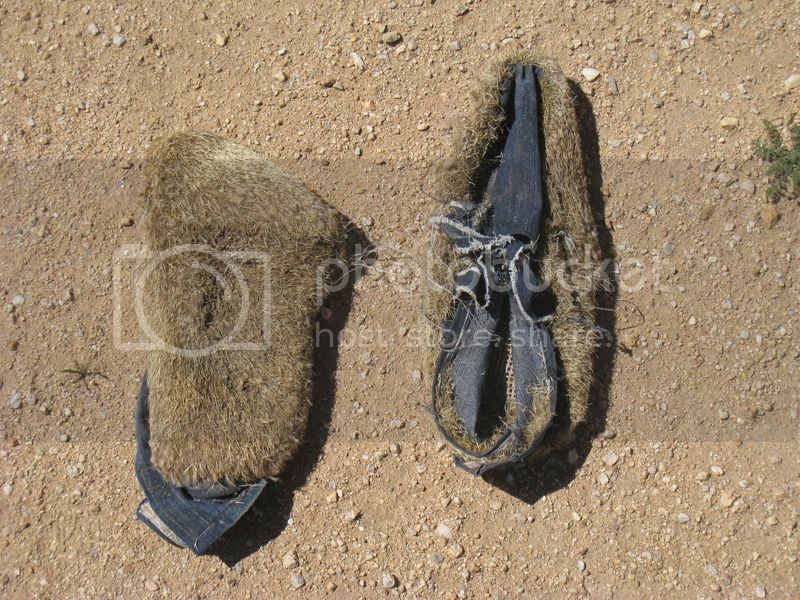 ...These specially made shoe covers were found right next to the highway, about 40 miles north of the Arizona-Sonora border. I'm guessing the owner of the footwear managed to elude the Border Patrol. Look ma, no tracks! ...The Illegals crossing in that area tend to kill ranchers that show them any kindness. Ironic huh ? They tend to sue you as well. It's called trespassing. But hey, take the illegals side by all means. In case you missed it, I said illegals have sued. Reading is fundamental.